When I was young, this was my mom’s hit recipe. Everybody loved her Kaya kueh. She would get me to pound the pandan leaves to get its extract. It was hard work extracting pandan essence. The leaves don’t yield much juice. I had to squeeze the leaves really hard just to get that one little drop. When artificial pandan essence was made available, I was all over it. However, in recent years, I have realised that nothing beats the real deal. However, I am still allergic to pounding and squeezing the leaves. Instead, I would boil the leaves in a little water and use the water. I think it works. My mom’s recipe uses white glutinous rice. I mixed mine with black because I read that black glutinous rice is more nutritious than white. The kaya (custard) part is usually green but I decided to go au naturel in my bid to cut down on unnecessary colorings and additives. So it got it’s glorious yellow color from the egg yolks. Mix all together and pour into a greased 8″ square pan. Steam for about 1/2 hour or till rice is cooked. Remove the pandan leaves. Then using a spoon, press down the rice firmly to kind of flatten them. This step is to make the rice a bit compact to prevent the custard from seeping into the rice part (I found out the hard way). Boil the pandan leaves in the 50ml water. Remove the leaves. Then mix everything well together. Pour the batter on top of the hot rice, through a sieve to ensure a smooth custard. Then steam for about 1/2 h or until the custard is cooked. Today is the official day to eat tang yuan. In my mom’s family,during my grandparents’ time, it was eaten only during the winter solstice (22 Dec). In the 1950s, before Singapore had easily available convenience foods, my grandmother and great-grandmother had to make it from scratch. They would soak glutinous rice overnight and the next day, grind it with an ancient heavy stone grinder to a fine paste. This watery fine paste would be collected and strained through a muslin cloth and pressed till dry. That was how they made the dough then. Today ready-made ones are available year round. You can get frozen ready-to-cook ones from supermarkets. They are also sold at food centres. These usually come bobbing in some kind of sweet soup called Ah Balling. The 1.5″ size balls are usually stuffed with either red bean paste, peanut butter or black sesame paste. I don’t like them in soup as it’s usually soggy and it makes me gag. The way my mom’s family does it is different. It’s like muah chee except that it’s boiled. The dough is really easy to make it yourself. Just get some glutinous rice flour. To that, add enough water to make a dough that is akin to play dough texture. The ratio is about 1/2 water to flour. The dough is then rolled into small 1/2″ balls. Drop them into boiling water. When they start to float, that means they are done. Fish them out quickly onto a plate and serve with ground peanuts, roasted ground soy beans and orange color sugar. This is the way my mom’s family eat tang yuan. As a kid, my favorite dip was the orange sugar (duh!). You can color them by adding coloring. I try, as far as possible, to use natural coloring like cocoa powder and matcha powder. My kids enjoy making interesting shapes out of them. But do make sure they are no bigger than an inch. Otherwise the inside will be uncooked and the outside will be soggy. Every time we make tang yuan, my mom would tell me her family stories. “If you drop it, your face will have white round spots, like the tang yuan. To prevent that, you’d have to wash your face with the water that the tang yuan are boiled in”. “After eating tang yuan, you are deemed a year older”. “When you make tang yuan, you are forbidden to say anything negative. Or scold anyone. Only positive things are allowed for good luck”. “If it rains on tang yuan day, it won’t rain during Chinese new year”. Of course we believe them with a very extremely large pinch of salt. 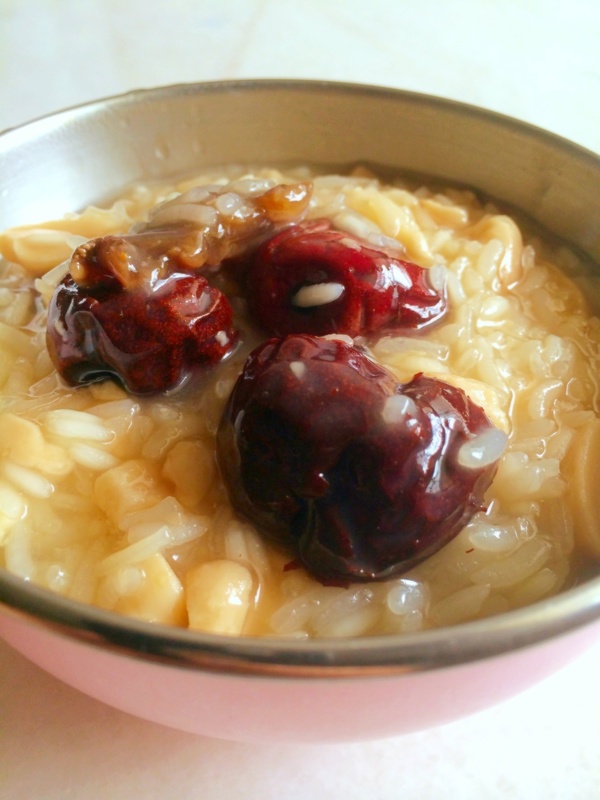 My Grandma used to make this special sweet rice dessert. We call it Ow Ow Mui. I know, sounds strange. Never knew why it has such a funny name. She was Hok Chia and this was one of the traditional dessert that she would cook. It has to be eaten on the 29th day of the first lunar month for good luck. On the day that we eat this, nothing negative must come out of our lips. It’s happy porridge day, when nobody is allowed to scold anyone. Over the years, I have searched for this recipe and asked around but nobody, apart from my mom’s family, has even heard of it. Lately, my search on the internet led me to Taiwan. I asked my Taiwanese friend and she confirmed that they have a similar dessert minus the peanuts and it is for post-delivery. My kids, my mom and I enjoy it very much. On some days, we have it for breakfast. Some days, even for lunch. It’s no longer reserved only for the 29th day of the 1st lunar month. To quote my mom:”I can eat it any time and every time.” Ya. So can I. In the pre-convenience food days, my Grandma would cook from scratch using raw peanuts which she would boil for hours. These days I just pop a can of sweet peanut soup. So that we can start eating sooner. Put everything into a pot and bring to a boil. Simmer until rice is just cooked. Add water if porridge looks too thick. I like it thick. Sweeten with orange colored sugar.